Pure VPN has launched what could be the best VPN deal of all time - 5 years of access to the VPN service for just $1.32 per month. That's a saving of 88% compared to the usual price of $10.95 per month. It's the perfect VPN deal for anyone who's been thinking of signing up for a VPN service but either hasn't got round to it yet or simply waiting for the right price at the right time. $1.32 per month means you'll get 5 years of service for just $79 which is amazing. The best bit? Not only is this the best and cheapest VPN deal ever, it also comes with a 31-day money back guarantee. So if you change your mind at any point in the next month, you can get your money back with no questions asked. There are plenty of reasons why VPNs are becoming must-have online tools these days. Firstly they're great for security and privacy - they route your internet traffic through an encrypted tunnel so no one can see what you're looking at or what you're downloading. Even your ISP won't be able to tell which websites you're looking at. The encryption also heightens the security of internet banking so no one can hack in and steal your passwords. VPN services are also great for unblocking sites that are blocked by your ISP or by governments in countries with a lot of censorship like China. And finally a VPN is also perfect for P2P file sharing and torrenting as it means no one can see who you are or what you're sharing. The best bit is that VPN services these days are so easy to use that even people who hate computers can make them work, and you can install them on your smartphone, tablet, PlayStation, Xbox, Chromebook, Chromecast and other devices as well as your laptop. 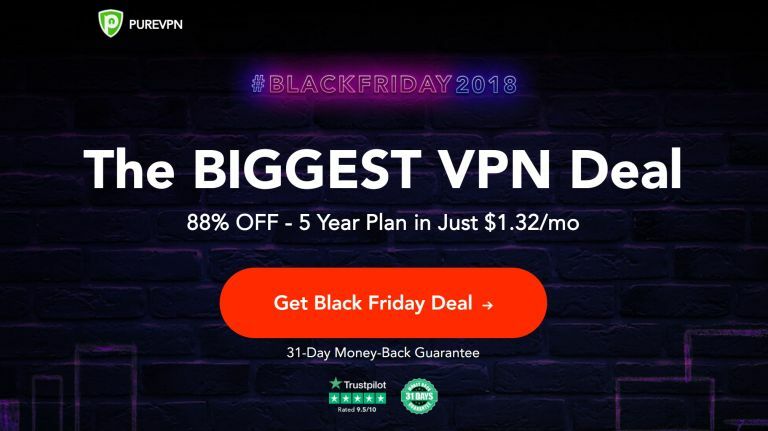 If you want to get this VPN deal, head on over to the Pure VPN Black Friday landing page to get going or check out our best VPN page to see more options.